A year ago today marks the day I changed my life. A year ago today I stepped into my grad school advisor's office and told him I had enough—I quit. After a disappointed nod of his head, I left the room and cleaned out my desk. I packed up my apartment, my life, and left the beautiful city of Montreal to move back home. I switched from a career in physics and research to pursue a life filled with butter and sugar. I wondered if I would regret my decision. I wondered if it was silly or irresponsible to pursue baking, especially since I had discovered my oven not more than a year earlier. I wondered if baking was simply an escape from physics and nothing more. I wondered how I was going to explain to people that I had given up on my goals to become a smart and successful scientist so I could make cookies. I wondered all of these things and so much more. Yet, a decision had been made. I was changing my life path. I crossed my fingers, took a deep breath, and leaped. I jumped off the proverbial cliff and it would take time to see where I would land. A year later, it feels strange to reflect back on my decision and my uncertainty. All the drama and change feels so much longer than a year ago (and so far away from me today). I almost wish future-me could have visited past-me, if only to whisper everything is going to turn out okay. It took a couple months, but I eventually found my footing. I'm currently working in a small bakery, mixing up everything from breakfast pastries to cakes and cookies. I fill cases with colorful, decadent desserts and pretend that calories don't exist (and, while I can convince myself, I haven't quite figured out how to convince my waistline). After my job at the bakery, I tutor students of all ages in math and science. It turns out I couldn't turn away from my physics background completely—I simply found a new way to enjoy it. Life is full of unexpected twists. You can take the physics out of the lifestyle, but it seems you can't take the physics out of the girl. Who knew? I don't regret the decisions I have made that lead me to today. In fact, knowing what I know now, dropping out of grad school may have been one of the best decisions I've ever made. I took a miserable existence and turned it into happiness—no small feat. The concerns that so plagued me just a year ago are miles away from me today. If I had never jumped ship into a sea of butter and cream, I would have spent the rest of my life wondering what if. I'm not sure where my life is going to take me, or what I'll be doing a year or even five years from now, but I've learned that it's okay not to have a plan. I've learned that I can trust myself. I can (and will) figure it out when I have the experience to know what's right for me. Life is about the journey. It's about trying something new despite the threat of failure. It's about being brave, strong, and having confidence in yourself. As Bob Moawad so beautifully phrased it, "The best day of your life is the one on which you decide your life is your own. No apologies or excuses. No one to lean on, rely on, or blame. The gift is yours—it is an amazing journey—and you alone are responsible for the quality of it. This is the day your life really begins." You and I, we'll find our place in this mad, mad world. One day we'll wake up and realize exactly where we belong. Maybe we're already exactly where we need to be. But if you haven't reached that special place, you can't be afraid to pursue your wild and crazy dreams, whatever they may be. This is your life and you deserve to do what you love every single day. It's true. You do. 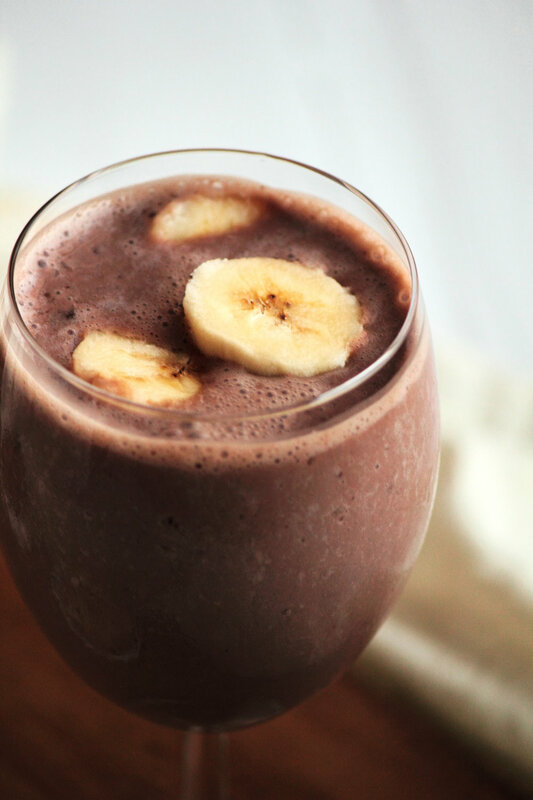 This Banana Cocoa Smoothie is sweet and refreshing. Though it uses tofu as a base, do not let this deter you. Tofu lends a thick creaminess to the smoothie without any flavor (plus tons of protein!). All the sweetness in the drink comes from the banana, with no added sugar. I added a tablespoon of cocoa powder for a chocolaty twist, since chocolate is always a good decision to make. 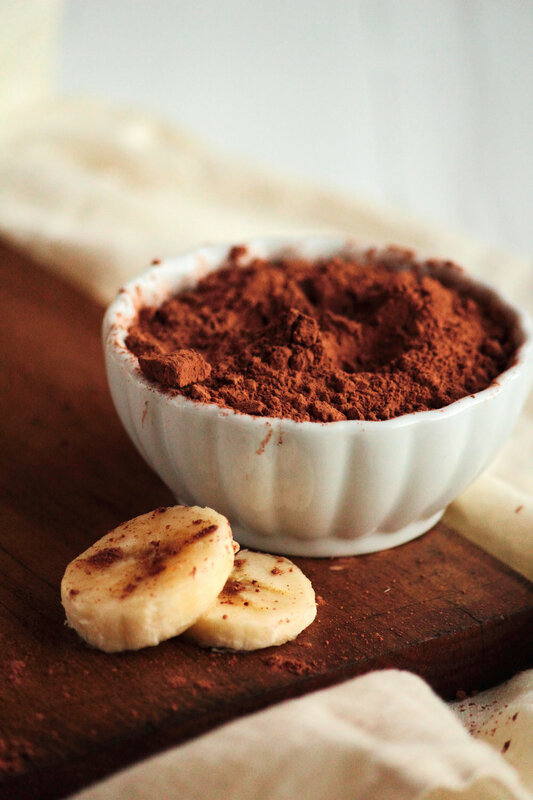 The combination of chocolate and banana is truly decadent, which makes the fact that this smoothie is healthy so much more sinful. In a blender, combine all ingredients and blend until smooth. Pour into chilled glasses and serve with banana slices, if desired.